Does Anybody Follow Mark Oshiro? 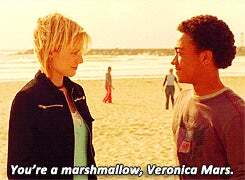 Also, Veronica Mars is Awesome! So I've been a fan of Mark Oshiro's (of Mark Reads and Mark Watches fame) reviews since he first started reviewing the Harry Potter and Twilight series. He is engaging, hilarious, and has brilliant taste in books and movies. I wanted to give him a shout out around here, since a lot of GTers are into fantasy and scifi. Mark is currently reviewing Trickster's Choice by Tamora Pierce, The Broken Kingdoms by NK Jemisin, and Untold by Sarah Rees Brennan on Mark Reads. Past highlights of Mark Reads projects include His Dark Materials trilogy, The Hunger Games trilogy, and the Newsflesh series, in addition to Harry Potter and Twilight mentioned above. On Mark Watches, Mark is reviewing Supernatural, The West Wing, and Veronica Mars. Some of the best Mark Watches projects include Friday Night Lights, Buffy the Vampire Slayer, and Avatar: The Last Airbender/The Legend of Korra. I am currently following his Veronica Mars reviews, which he is doing as a special double feature, where he adds several reviews every couple of weeks as opposed to every other day like his regular reviews. I got so into the last few episodes I reviewed that I finished the first season today, and am already inhaling the second season. So many cool guest stars (Adam Scott! Amanda Seyfried! Charisma Carpenter! Alona Tal! Alyson Hannigan!)! Such great character development. The characters are relatable, and the plot is well executed. Just so good.